Although coal trade only accounts for about 5% of trade flows in energy fuels, the volume of U.S. coal exports has steadily increased, from 50 million short tons (MMst) in 2005 to a record 126 MMst in 2012. Export volumes set a monthly record in March 2013, before declining in the second half of the year. Coal exports are an increasingly important source of revenue for U.S. coal producers, railroads, and barge companies. Coal's transportation through the supply chain affects its delivered price. The recent growth in coal net exports has been driven by volume increases in steam coal exports and price increases in metallurgical coal, which generally sells at a significantly higher price per short ton than steam coal. Note: Data for 2013-15 are from the February issue of the Short-Term Energy Outlook. According to EIA's Quarterly Coal Report, most U.S. coal exports go to Europe (50%), followed by Asia (26%), North America (11%), and South America (10%). Export growth has been strongest in Asia and South America. The U.S. continues to import small quantities of coal, primarily from Colombia (73%), Canada (14%), and Indonesia (8%). U.S. coal imports in third-quarter 2013 decreased to 2.4 MMst from 2.8 MMst in second-quarter 2013. Despite the 2013 pullback in both volume and value, coal exports will continue to be important for companies involved in coal production and transportation. Key drivers of future U.S. coal exports include global coal demand and production challenges that may arise in domestic production in China and India, the world's major coal consumers, and in production by leading global coal exporters, including Australia, Indonesia, and South Africa. 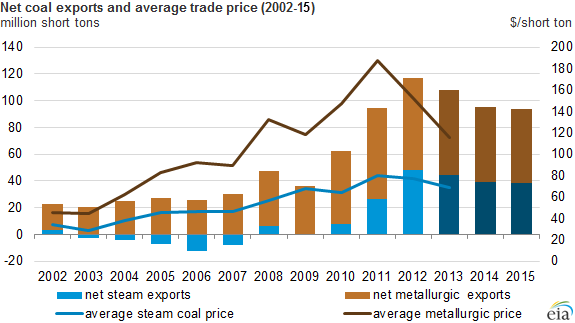 The Annual Energy Outlook 2014 Reference case projects modest growth in U.S. coal exports, which reach 160 MMst by 2040.